Menulog delivers for Fish's Seafood Market so you'll be able to track your courier on a map. 2 x Calamari, 2 x Scallops, 2 x Prawn Cutlets, 1 x Fish and Chips with Tartare Sauce and Fresh Lemon. 2 x King Prawns, 2 x Oysters, 2 x Sea Scallops, 2 x Calamari, 2 x Prawn Cutlets, 2 x Mini Dim Sims, 2 x Spring Rolls, 2 x Fish Bites. Served with Aioli and Asian Dipping Sauce. 4 x Dory, 4 x Chips, 12 x Calamari with Tartare Sauce and Fresh Lemon. All fish are served grilled, crumbed, battered or cajun style. Served with chips, salad, tartare sauce and lemon. With nam jim sauce and steamed rice. In a garlic cream sauce. All served with chips, salad and tartare sauce. 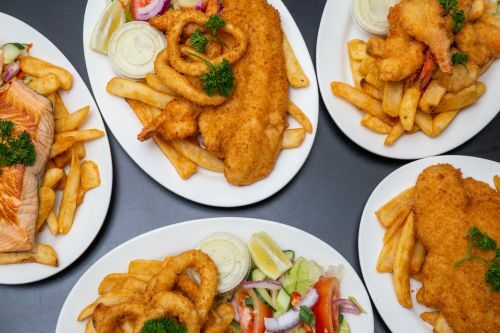 Fish served grilled, crumbed, battered or cajun style. Crispy battered fish with Thai chilli sauce and steamed Jasmine rice. With grilled prawns, calamari, scallops or whiting. Cooked to your liking. Grilled, crumbed, battered or cajun style. Freshly crumbed crispy fish and a few chips on a toasted knot roll with lettuce and tartare sauce. On toasted knot roll with lettuce, cucumber, beetroot, onion and carrot with your choice of sauce. Crispy veggie patty with lettuce, cucumber, tomato, beetroot, carrot, onion, avocado and sour cream. On a toasted knot roll with lettuce, cucumber, tomato, beetroot, onion and carrot with your choice of sauce. With lettuce, tomato, bacon, cheese, aioli and BBQ sauce. With salad, avocado and sour cream.